This unique study is the first systematic examination to be undertaken of the high priesthood in ancient Israel, from the earliest local chief priests in the pre-monarchic period down to the Hasmonaean priest-kings in the first century BCE. Dr Rooke argues that, contrary to received scholarly opinion, the high priesthood was fundamentally a religious office which in and of itself bestowed no civil… responsibilities upon its holders, and that not until the time of theMaccabean revolt does the high priest appear as the sole figure of leadership for the nation. 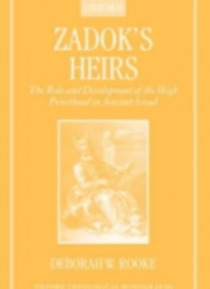 However, even the Maccabean / Hasmonaean high priesthood was effectively a reversion to the monarchic model of sacral kingship which had existed several centuries earlier in the pre-exilic period, ratherthan being an extension of the powers of the high priesthood itself. The idea that high priesthood per se bestowed the power to rule should therefore be reconsidered.